Size Array: 18 in., 24 in. 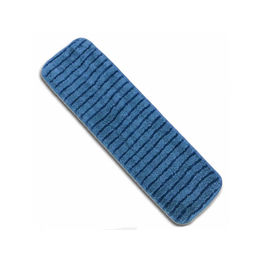 Microfiber Flat Pad Wet Mop Scrubber is a Premium split nylon/polyester blend microfiber that provides optimal damp mopping performance. Vertical strips reach into tile grout line to cut cleaning time in half on walls and floors. Advanced hook-and-loop backing attaches pads more securely. Back injuries are reduced since no lifting of bucket and wringer is required. Dries quickly to reduce slip falls. Water, chemical reductions to 90%. Removes more bacteria than conventional mops. Withstands 300 machine laundry cycles.